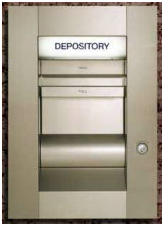 NBE services all models of night depositories: American Vault, Diebold, Hamilton, Mosler, Lane, and more. NBE’s Full service Drive thru Detailing includes, Cleaningand polishing your Night Depository to give your customers the best experience when they come visit your location. 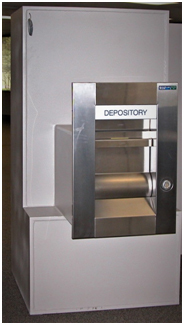 NBE offers Amercian Vault’s Model 85 Night Depository. 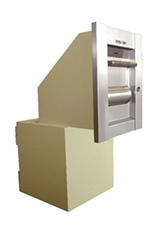 The Model 85 comes standard with capabilities for envelope and bag deposits. A single door provides customer access for both envelope and bag operations. 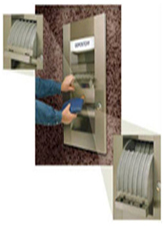 The envelope opening can be accessed without the use of a key and the bag opening is accessed only with a key. 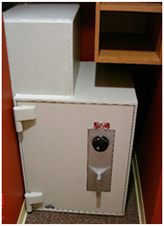 The large capacity bag deposit compartment is exposed only when the required key has operated the lock in the depository frame. The compartment is big enough to accommodate a fully packed bag up to 7″ x 11″ in size. The Model 85 is also available with bag only operation and requires akey with each use.